Layers both literal and symbolic are explored in Domenico de Clario’s work, writes Andrew Stephens. FATHER’S COAT WAS bought in the winter of 1963 at the Leviathan Building in Bourke Street. The label stitched inside confidently announces “It’s a Man’s World at Leviathan” but old father is no leviathan – in fact he has shrunk in recent years. The coat, now mine, would swamp him. Clothes can carry deep emotional nuances in their folds, stitches and pleats, patterns and hues. In the way they are worn, their textures, they reveal much about a person. Garments can hold memories, too, and histories, though we often don’t know it. De Clario loves investigating such territory, so it is no surprise that this man, who has been doing his affecting other-worldly installations for the past 40 years, should be involved in two projects that deal in some way with clothing and the idea of home. I also recall seeing him – or his silhouette, at least – in a glowing tent in the full-moonlit gardens of the Heide Museum of Modern Art, in the early hours of an icy morning in mid-1995. He was doing one of seven performances for a project called seven-ness: sublunar, in which various sites and objects around the gardens were lit like glowing jewels or chakras. He was playing a piano beautifully. De Clario has created many other events in between, and at various times his art pieces have been explored – performed is not quite the right word – in factories, foundries, gardens, even a sports and recreation centre, and, of course, at many galleries, large and small, in Australia and abroad. De Clario’s MARS project emerged from one of those moments of serendipity that so often can provoke an art event. The gallery’s director, Andy Dinan, had been telling him about her “Off Your Back” scheme, started with a group of friends four years ago, which encourages people to drop off their old coats for the homeless. They are dry-cleaned, delivered to the StKilda Crisis Centre and distributed on the street – on to the backs of the homeless – within 48 hours. So far this winter, 4500 coats have come in, with about 20,000 since the scheme started. De Clario was so enthused with the idea, he offered to create an art event around it, responding to each coat’s individual possible history and the act of it being passed on to someone in need. This new “history” for each coat will be entirely improvised. After each afternoon’s “wearing”, done according to the Tibetan Buddhist principle of Tonglen – breathing in pain, breathing out ease – DeClario will pin up all his responses on the gallery wall, alongside a description of each coat. And at the end of each week, he will hand-write a message to the new owner of the coat. He carefully folds the note, along with the reading text and the drawing, and leaves them in the pockets of the coat for the new owner to discover and perhaps ponder. This beautiful, generous ceremony is part of De Clario’s larger-scale project for helping to “humanise the world” by making art something more personally meaningful, more experiential than “the art object as an end in itself”. 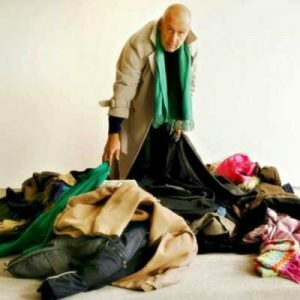 He is deeply interested in how he can make objects – in this case, the coats – more than simply “the visible container” and to bring a mindfulness to the wearer. De Clario’s other (two-year) project at Albury Regional Art Gallery and the National Trust-listed Bonegilla Migrant Camp also explores notions of identity, homelessness and the idea that global culture is composed of individual, minority voices. In this case, those voices are embedded in the objects and documents left behind by the thousands of European migrants who were interned at Bonegilla between the late 1940s and 1971. Indeed, the underlying theme to the Bonegilla work – and the MARS coats project – is the very idea of what constitutes home. “What is home, how do you manifest both the longing for home and the constant disaffection with it?” he asks. “No home ever seems to be the home you are looking for. It is the fate of every migrant to be in that state. All of us here in the last couple of centuries – there’s a sense of us being guests in this country and clearly, metaphorically, hanging on to the edges of the land.